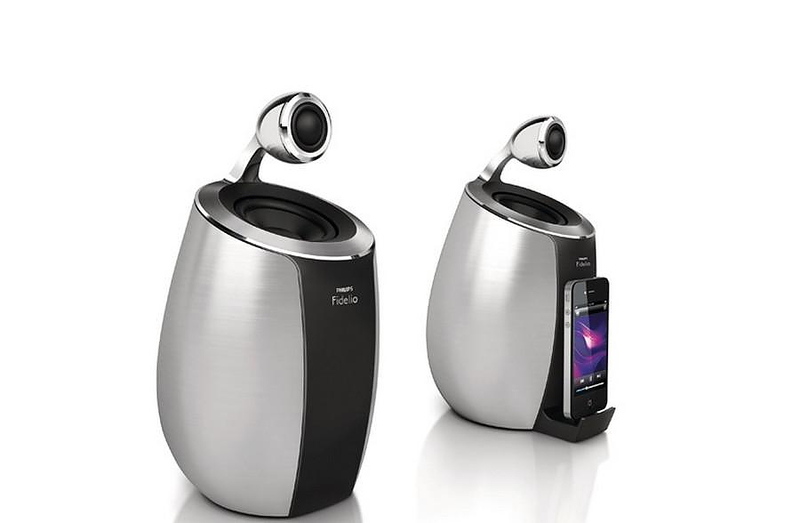 HomeBlogTechnologyPhilips Fidelio SoundSphere Wi-Fi / Airplay Wireless Speakers. 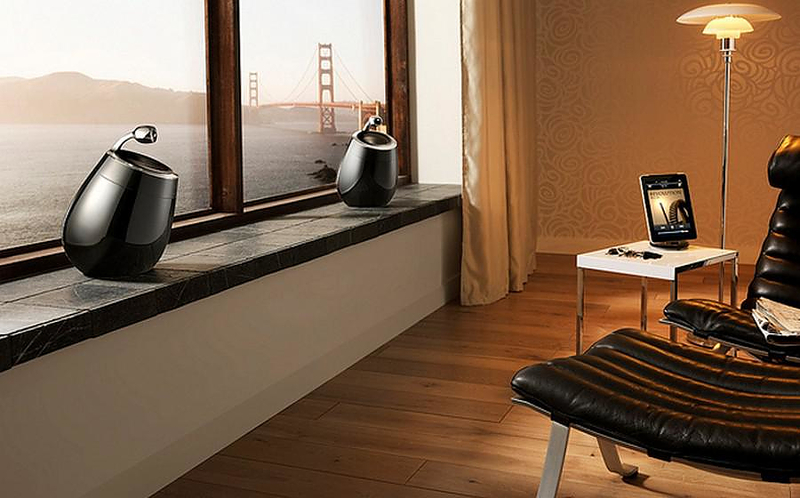 The Philips Fidelio SoundSphere is set of wireless speakers that stands out from the crowd. 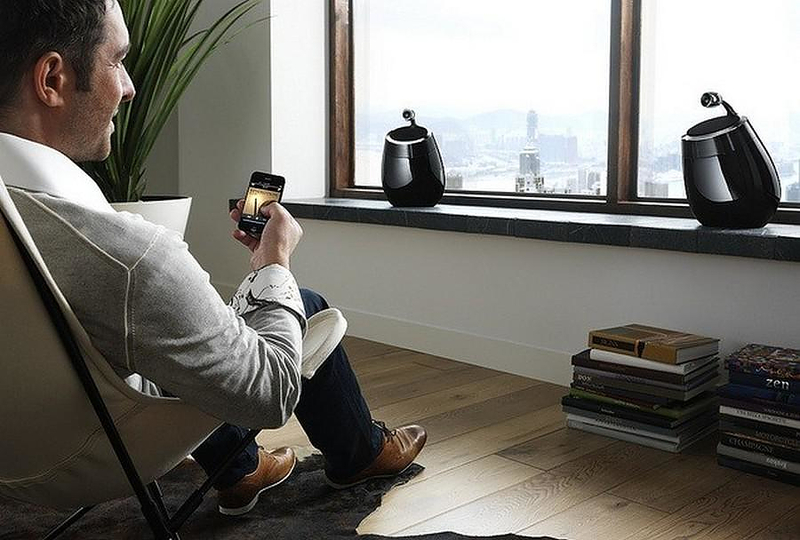 Whereas most Wi-Fi speakers are designed for casual background music listening in the bedroom or kitchen, the Philips Fidelio SoundSphere is a high fidelity centerpiece system aimed at people that appreciate and demand quality sound. 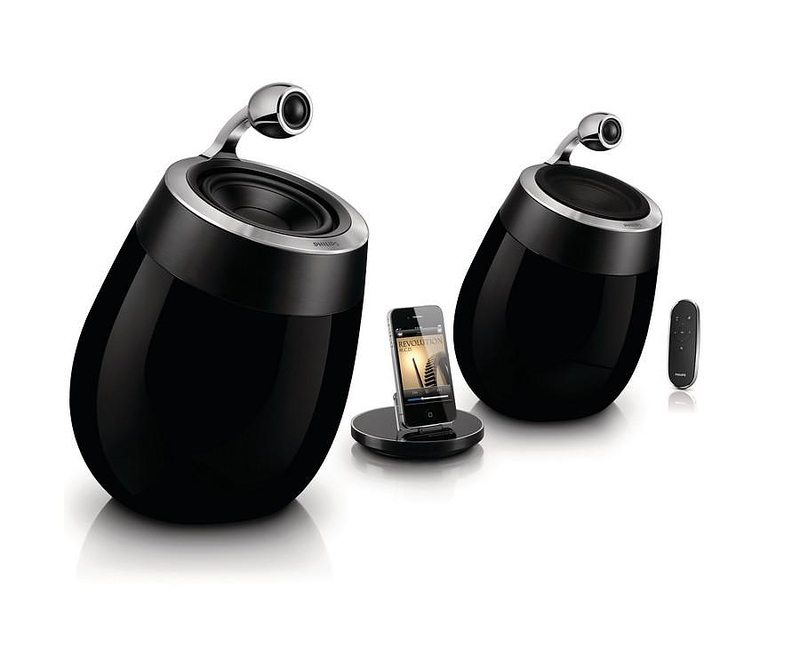 Essentially the Philips Fidelio SoundSphere is a set of superior performance compact amplified speakers with built-in Wi-Fi and AirPlay. This means that yyou can conveniently stream music wirelessly from your iPod, iPhone, iPad, or other Wi-Fi enabled digital playback device, without cluttering up your designer lounge with cabling and such. And to top it off this new offering from Philips has an attractive high-tech looking design that looks just stunning. The gleaming gloss-black finish and silver trim looks just superb, while the placement of the tweeter in a separate enclosure is an eye-catching visual feature. The handcrafted speaker enclosure is designed to maximize the natural acoustic properties of the wood, just like a fine musical instrument. The advanced design and precise shape of the enclosure combine to eliminate distortion and deliver crystal clear, life-like audio. 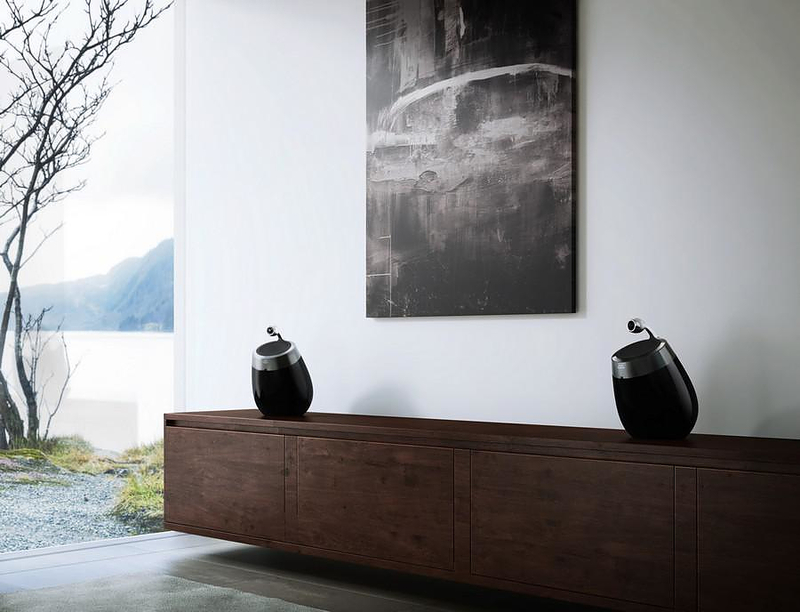 The highlugh of the design though is unquestionably the SoundSphere Speaker Technology, a free-floating tweeter design creates a wider sound-stage and much more natural audio experience than traditional speakers. 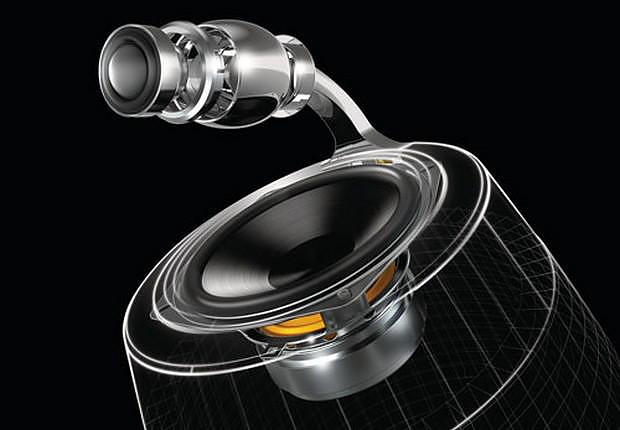 It does so by centering the tweeter directly above the woofer, a single sound path is created, delivering a more detailed and natural audio experience. Build quality is nothing short of incredible, brought about by bonding multiple pieces of hand-crafted wood together and slathering it in seven layers of lacquer. The use of advanced wood bending techniques gives the enclosure its distinctive curves, as well as providing the rigidity needed to keep distortion at bay. One of the speakers features a Wi-Fi receiver and a 2 x 50W digital amplifier which provides a hefty 100W RMS total output power. Yet the distinctive feauture is the wireless capability. 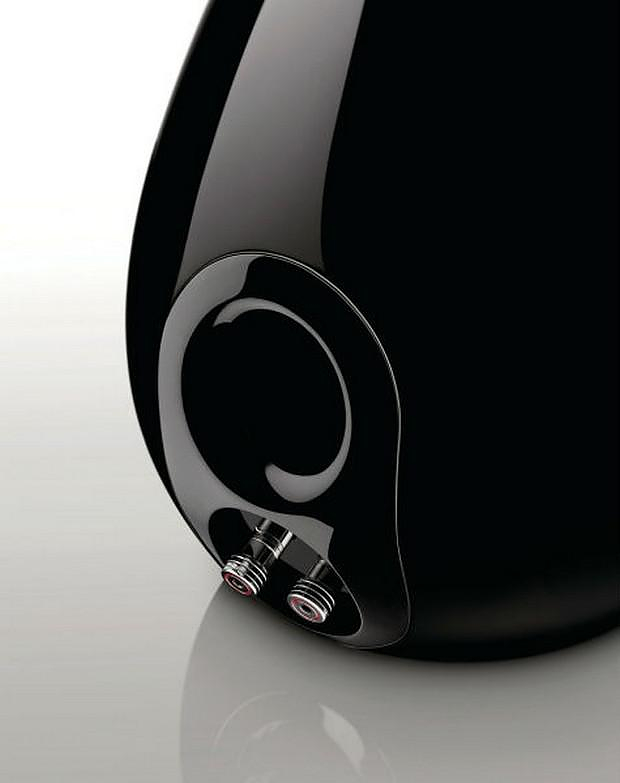 AirPlay lets you stream your entire iTunes music collection to your Fidelio Soundsphere speakers using your existing Wi-Fi network. 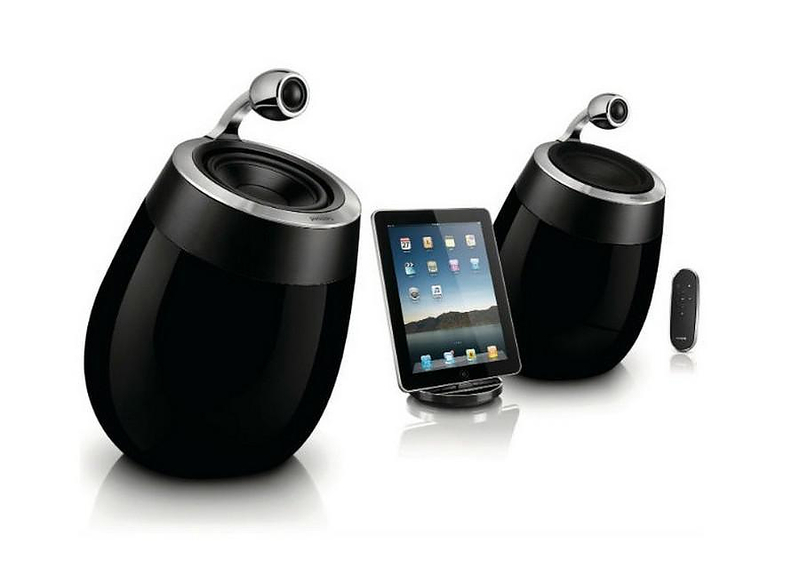 It plays wirelessly from iTunes on your computer, iPhone, iPad or iPod touch to any Airplay enabled speaker, and even lets you play your music simultaneously on multiple AirPlay speakers, allowing you to enjoy your music throughout your home. 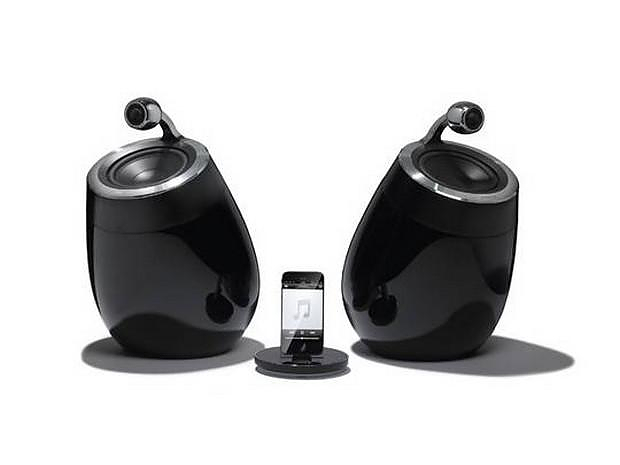 They also include all the ocnveniences one would exepect form a quality pair of wireless speakers, a 3.5mm aux input for audio devices, AUX-in jack for easy connection to almost any electronic device, and wireless remote. 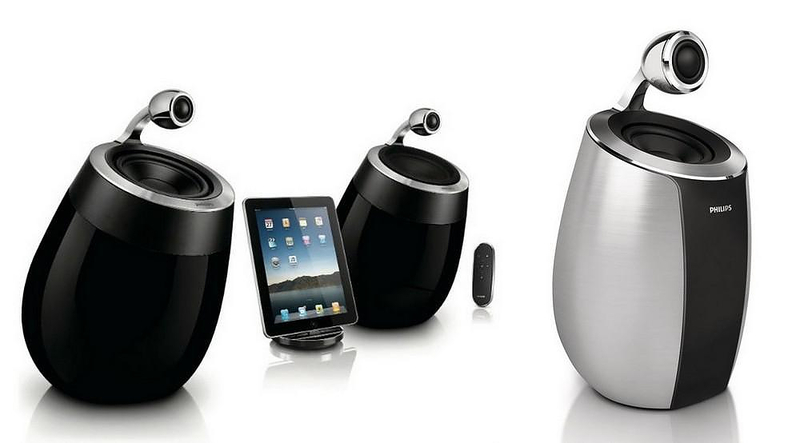 For Apple ownders there is also in the box is a stand-alone docking station that lets allow charging your Apple device while it streams via Airplay. 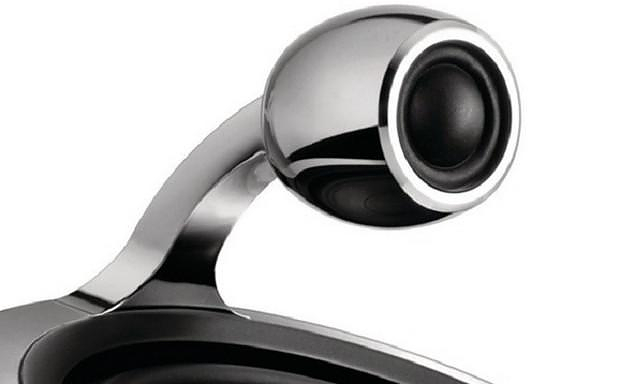 The dock itself a gorgeous-looking round device that matches the wireless speakers perfectly in its gloss black and silver styling. 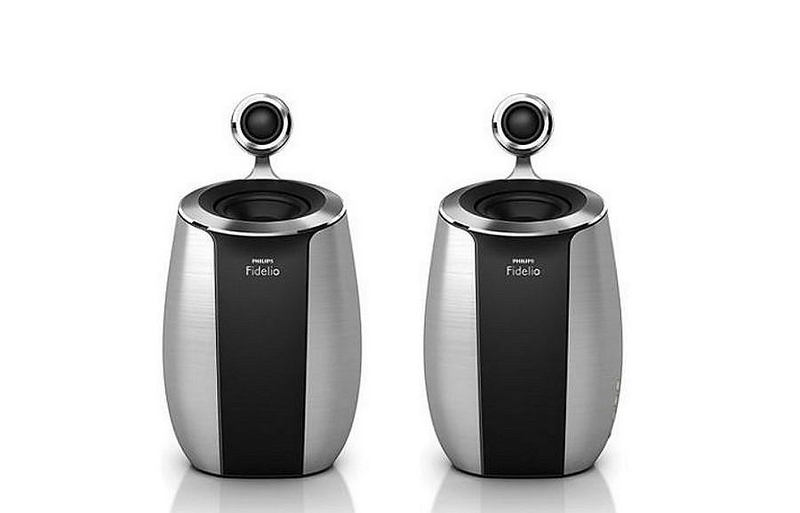 Finally the Philips Fidelio SoundSphere wireless speakers are compatible with Philips’ Fidelio App. An free app available on the iTunes App store, which offers lots of useful features to expand your device’s functionality, including access to over 7000 internet radio stations, sound-setting controls, clock and multiple alarms and a sleep timer. 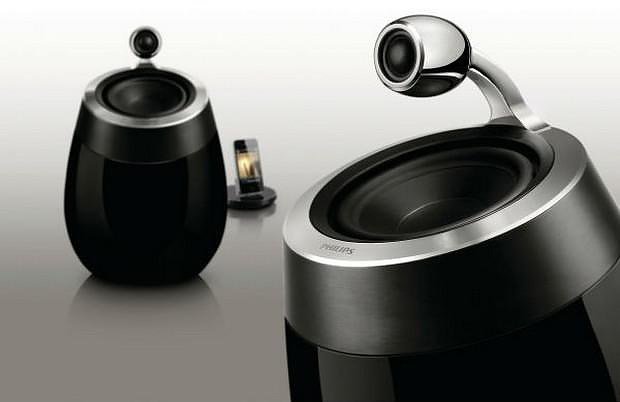 With a suggested retail close to 800€ the Philips Fidelio SoundSphere wireless speakersare not the cheapest option available, but as with most thing in life you get what you pay for. 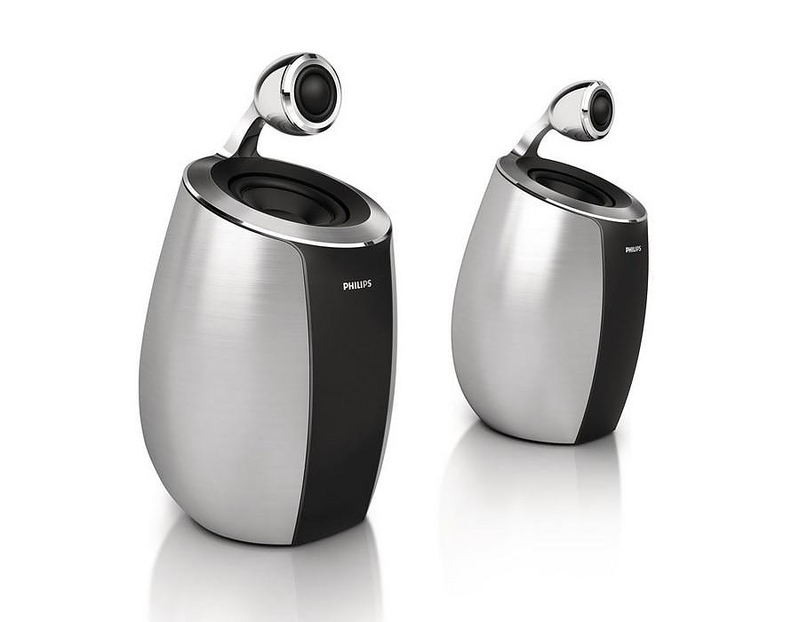 Exceptional design and superior build quality come at a substantial price premium, yet Philips’ offering is an exciting option for the style conscious individual that wants big sound form a small and elegant device. Music Branch Headphone Splitter by Kikkerland. TDK Boombox portable audio system.